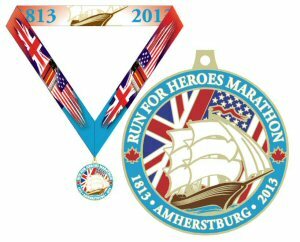 The World Alzheimer's Day Run For Heroes Marathon - a fast and flat boutique marathon in picturesque small town Amherstburg, Ontario - was named the place to qualify for the Boston Marathon by iRUN Magazine in their 2013 Great 2013 Great Canadian Marathon Guide. Taking place on September 22, the Run For Heroes Marathon is also the official Marathon for the War of Erie Bicentennial and is Canada's most southern marathon located just 25 minutes by car from the Detroit border. The course is one of the flattest runs in the world, with an elevation difference of 38 feet. Runners will experience a gorgeous waterfront course along the Detroit River and the Historic Fort Malden, a Parks Canada Historic site that was involved in the Battle of 1812. "Two Hundred years ago the British and American Naval forces fought a bloody battle on the water in Lake Erie near Pelee Island. This year we honour the lost and celebrate 200 years of friendship with our American neighbours," said race director Chris Uszynski. The marathon weekend includes run and walk divisions for the half marathon, 10k, and 5k. The Run For Heroes Marathon also offers a wheelchair/push rim wheelchair and hand crank division for the marathon. Last year the Run For Heroes Marathon was listed in the top marathon medals in the country, "and we will continue to produce finishers' hardware that pays respect to the United States and Canadian relationship," said Uszynski. "This years medal icon is a tall ship running forward through with the Union Jack and stars and stripes flanking the background. It is framed by a sky and water-coloured blue ring with maple leaves." Every runner will receive the commemorative six-colour finishers medal, shirt, and be entertained along the route. "This race is a boutique Marathon, small, fast, flat and intimate where you actually get an amazing experience. Especially if you are sick of running with 30,000 of your best friends, you will love this race," added race director Chris Uszynski. The Run For Heroes Marathon attracted 1900 runners from across North America in its second year in 2012, where 1 in 5 qualified to run Boston this year. Run For Heroes is expected to attract 3000 runners this year. "The race was a pleasant surprise. The course was pancake flat, and the scenery through Amherstburg, the local farms, and along the Detroit River was beautiful, plus the weather was perfect. If someone wants to qualify for Boston then this is the race for them," said Jim Crist, owner of Marathon Pacing a group that is pacing 40 Marathons around North America this year. Proceeds of the race go to the Alzheimer Society of Windsor Essex for Caregiver Programs www.alzheimerwindsor.com. Runners are asked to raise money through pledge forms and donations. Registration information can be found online at www.runningflat.com. Amherstburg has been ranked Canada's safest community two years in a row an d is located in the heart of Southern Ontario's wine country. The town is located at the mouth of the Detroit River and Lake Erie and is a 25-minute drive off the Ambassador Bridge. The town is home to Historic Fort Malden, a Parks Canada site integral to the Battle of Lake Erie. www.amherstburg.ca. To view the photo associated with this press release, please visit the following link: http://www.marketwire.com/library/20130607-800rflt.jpg. Last year named the Top 10 Marathon Medal this year's will be keepsake with all participants getting a medal for Marathon, Half Marathon, 10K and 5K. Celebrating the Battle of Erie Bicentennial.